The C-line begins a new era with the New Citroën C4 Picasso and Grand C4 Picasso. 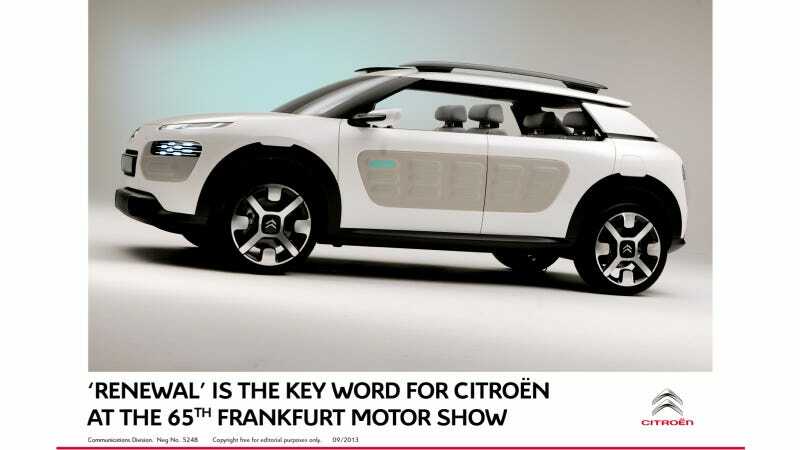 The renewal is clearly expressed with the Citroën Cactus concept, a vision for the future of C-line models. The DS-line is as dynamic and engaging as ever, with over 370,000 units sold since 2010, 66% of which have been conquest sales. An exclusive new trim, Faubourg Addict, makes its debut on DS3, DS3 Cabrio, DS4 and DS5. Also on display are two concept cars, DS3 Cabrio Racing and, for the first time in Europe, Wild Rubis. Citroën’s technological offensive is demonstrated by PSA Peugeot Citroën’s new EMP2 platform. The platform is making its debut on the new Citroën C4 Picasso and Grand C4 Picasso, boasting the lowest CO2 emissions in the segment at 98g/km. The brand’s ‘Créative Technologie’ is also reflected in an increasingly efficient engine line-up, including a new Euro 6 BlueHDi powerplant. The BlueHDi engine will be available with 150bhp in the New C4 Picasso and Grand C4 Picasso, and with an even more powerful 180bhp version in DS5. This technology offensive is also reflected with an addition to the PureTech petrol engine family and the full-hybrid solution called Hybrid Air - which combines compressed air and hydraulics, an expertise written into Citroën’s DNA. Illustrating the renewal of the brand’s sporting endeavours, Citroën is presenting the C-Elysée WTCC, which is set to race in the 2014 FIA World Touring Car Championship with two outstanding drivers - Sébastien Loeb and Yvan Muller - at the wheel. This commitment is a new sporting and technological challenge for a brand that has won eight World Rally Championship Manufacturers’ titles. Citroën Cactus is more than a concept car; it represents a vision for the future models in the C-line. Citroën is shifting the paradigm with this new car, shedding the superfluous and bringing well-being firmly into the limelight. Citroën Cactus is a desirable, user-friendly car that creates a unique harmony between the distinctive and the practical, offering comfort for all occupants with easy-to-use technology. Citroën is exhibiting two major new products at Frankfurt; the New C4 Picasso - which has just been launched and has already sold over 16,000 units - and it is the world debut of the New Grand C4 Picasso. Featuring clearly differentiated styling and design signatures, the two new models aim to replicate the enormous success of their predecessors. The two new cars each have their own distinctive body style that immediately sets them apart. The New C4 Picasso is immediately recognisable with its C-shaped chrome-finished side signature, an enveloping tailgate conveying spaciousness and robustness, and 3D-effect LED rear lights inspired by the Tubik, Survolt and Revolte concept cars. The Grand C4 Picasso clearly stands apart from the 5-seater version with a larger body, roof arches underscoring the side signature, a distinctive high-tech front end, and unique 3D-effect lights at the back with an all-new deep-set design. versions emitting a lowest-in-class 98g/km of CO2. The New Citroën C4 Picasso and Grand C4 Picasso will soon be available with a new BlueHDi engine. This new powerplant is Euro 6-compliant and features selective catalytic reduction (SCR), the most effective way of minimising NOx while reducing CO2 emissions. Having made its debut at the Goodwood Festival of Speedin July, DS3 Cabrio Racing concept combines the best of the DS3 Racing hatchback with the open-top sophistication of new DS3 Cabrio. Extensively customised with dynamic styling, DS3 Cabrio Racing features a bespoke Moondark matt textured grey paintwork with special gloss black 19” alloy wheels. First unveiled at Shanghai in April, and making its European debut at Frankfurt, the Wild Rubis concept car previews a future SUV and confirms the DNA of the DS-line with its unique styling, impressive refinement and outstanding finish. A new take on the SUV with a singular blend of power and sophistication, Wild Rubis is a strong and bold statement that continues the story of the DS-line, which is as distinctive and rebellious, yet refined and sophisticated as ever. A new body colour, called ‘Whisper’. A deep black with subtle purple nuances. Diamond-effect wheels with Whisper-coloured centres coordinated with the body paint. The Faubourg Addict trim showcases new techniques for the automotive sector and reaches new heights for customisation and refinement. Available in selected markets from October, further body colours will also be available. Debuting on the New C4 Picasso range, the Euro 6 compliant BlueHDi 150bhp engine (mated to a 6-speed manual gearbox or 6-speed automatic) will soon be available on DS5 as the BlueHDi 180 with a 6-speed automatic transmission. The BlueHDi engine delivers high levels of power, considerably reduced fuel consumption and low CO2 emissions with a minimum 110g/km for the New C4 Picasso HDi 150 version and 114g/km for the DS5 HDi 180 automatic. The new selective catalytic reduction (SCR) system, located ahead of the particulate filter, continuously transforms NOx into water vapour (H2O) and nitrogen (N2), both of which are harmless. Using innovative, efficient and economical technologies, Citroën is introducing another engine to its PureTech range with a turbocharged powerplant, the e-THP 130, the first PSA Peugeot Citroën Euro 6 petrol engine, joining the VTi 68 and VTi 82 units. The e-THP 130 engine combines impressive performance - 130bhp at 5,500 rpm and peak torque of 230 Nm at 1,750 rpm - with low CO2 emissions of just 110g/km. A technological breakthrough, Hybrid Air uses a combination of air and hydraulics to reduce fuel consumption by 45% in urban driving compared with an equivalent petrol engine. Well suited to city cars, Hybrid Air is displayed in the latest C3, delivering in excess of 94mpg over a combined cycle and 69g/km of CO2. Based on a combination of several proven components and technologies, Hybrid Air requires no additional batteries making it more affordable, easier to recycle and the system doesn’t have an effect on the amount of cabin space. After dominating road races around the world for over 20 years, winning five Rally-Raid World Cups and eight World Rally Championships, in 2014 Citroën will be competing in the FIA World Touring Car Championship (WTCC) - an exciting challenge for Citroën Racing and team drivers Sébastien Loeb and Yvan Muller. The team car, the C-Elysée WTCC will make its first public appearance at Frankfurt. The C-Elysée WTCC is based on the C-Elysée, a C-segment saloon aimed principally at fast-growing international markets. Already widely acclaimed by customers, the C-Elysée is currently 30% ahead of its initial sales target, with 30,000 orders placed. Under the bonnet, the Citroën C-Elysée WTCC is powered by the same 1.6-litre direct injection turbocharged engine as the DS3 WRC. Power output is now close to 380bhp with a front-wheel drive transmission controlled by a 6-speed sequential gearbox. Citroën’s FIA WTCC commitment underlines the importance of motorsport as a technological laboratory and reflects the brand’s ambition to step up international growth.